As expected, Infinity Ward’s Modern Warfare 3 and Epic Games’ Gears of War 3 appeared early on in Microsoft’s event to whet player’s appetite. MW3 showed what looked to be the first mission of the game. You start by swimming under water and setting explosives to blow up a ship. From that point, you take an inflated raft to your next location while firing at enemies. The environment seems bleaker than last time, but the gameplay is the same first person shooter action that fans know and love. Although they did not comment on the rumor that the online mode will be a pay-play service, I will ask a floor representative tomorrow for a confirmation. Chris Bleszinski, Design Director, and Ice-T, rapper and voice over actor, took the stage to demo live gameplay footage of Gears of War 3. Although nothing looked different, that was not necessarily a bad thing. Gears will have the same tone and violence that is expected plus bigger and badder monsters will be around to terrorize Fenix and his squad. Get your guns ready; there is a lot of killing in our futures. Yesterday, we posted an article about what might be in store for Microsoft at E3. Originally, we speculated that Kinect Star Wars would be the most promising use of the motion controller, and it could possibly steal the show. However, we were pleasantly surprised that more developers announced they will use the device this year in order to give players the most immersive gaming experience to date. In the end, it was not the Jedi’s that captured my attention. Instead, it was Tom Clancy’s Ghost Recon Gunsmith mode and Mass Effect 3’s overall use of voice recognition that really impressed me. Although games like Disneyland Adventure or Sesame Street Once Upon a Monster represented great ways to bring in younger gamers without the barrier of a controller, I found myself wanting more especially because of the augmented reality applications already being developed. Thankfully, Ghost Recon blends the motion controls in a way that is similar to these party games but incorporates them in unique ways. In the Gunsmith mode, you can spin your firearm with your hands and make the perfect weapon without a physical controller. In fact, if you want to quickly change the range of your gun for a particular fire fights, just say “short range” or “long range”. Kinect will understand your command and edit your gun to the mode you requested. 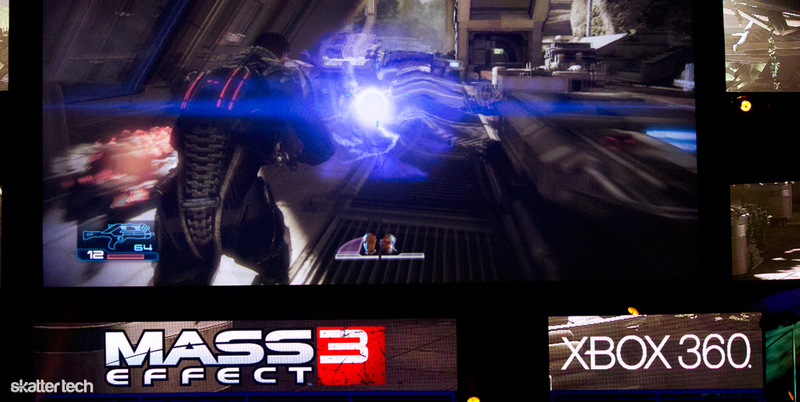 For Mass Effect 3, voice recognition reaches a whole new level. You will be able to speak the dialogue choices that Shephard will encounter putting the player right into the mind and soul of our hero. His voice is your voice. In regards to the battle mechanics, you can now announce your tactics, and your squad will respond accordingly. Although these two additions are not essential to BioWare’s space epic, they provide new ways for player’s to experience a video game on a more personal level. However, video game developers are not the only companies implementing motion and voice controls into their user experiences. In one of the biggest announcements of the day, Marc Whitten, Corporate Vice President, revealed that Bing, YouTube, and Xbox Live TV will be available for Xbox consoles everywhere. What is especially interesting about the search engine plus Kinect combination is that remote free television is now a more affordable reality. At the event, they searched X-Men, and in a matter of moments, every video game, film, and comic strip that was associated with the franchise was available. Then, all you had to do was say “X-Men 2”, and the film would start playing. It seemed incredibly intuitive, and a great way to introduce non-gamers to the simplicity of both the Kinect and Xbox. Going even further, UFC’s Dana White came onto the stage to show how using motion controls with Bing can let you search statistics and old matches while you watch a fight. UFC and ESPN are just a few of the companies that will bring this feature to the console, and although it seemed like just a demo, this is a promising way to cater toward the on-demand mentality of today’s television audience. Plus, if this perk is combined with Xbox Live TV, it would be possible to mix the recording aspects of a DVR with Kinect voice recognition. Anytime you want to access an old episode or clip it will be just a voice search away. Aesthetically, Xbox is going through a brand new overhaul giving a cleaner look to match its new controller-free experience. The updated dashboard will have an all white background displaying a tile layout of content in a given category. If you want to see the icons in another section just say the name, and the interface will move you to that screen. It is important to point out how similar this new look is to the Windows Phone UI, and it seems that Microsoft is bringing this intuitive live tile experience to all of their products. At the D9 conference we already saw that Windows 8 will use a similar layout. With this new Xbox Dashboard, it is clear they found an interface that resonates well with its market. Truthfully, it really looks like a more natural layout, and with the ability to search for content using Bing and voice recognition, controller-free television definitely made its mark. This was the event Microsoft needed to show that they possessed the most superior motion controller to date. With Kinect Fun Labs, you can really see the diverse uses of this advanced piece of tech that the other two consoles just cannot match. Fun Labs will allow users to search for the latest or most popular applications that use the motion or voice recognition software. At the event, Microsoft debuted Finger Tracking and Object Capture as two of their biggest—and arguably, coolest—programs. Finger Tracking allows you to manipulate photos any way you want. In fact, you can even draw in the background of a photo and rotate the picture so you can see your new image in its awesome 3-D glory. Object Capture lets you scan things in real life and bring them into the digital realm. At the event, the developers imported a stuffed animal into the game and made it jump around. Although the tech was still primitive, each of these demonstrations showed an innovative way to maximize the use of the Kinect. Although MW2, Ghost Recon, Kinect, and Fun Labs all had solid showings, it was not until Halo 4 came on the screen that the Galen Center went insane. Up until the final moments of the event, Microsoft only announced that Halo Anniversary Edition would be coming to the 360. This will be a remastered version of the first game, but even though it is an updated version, the graphics left much to be desired. As the event was coming to a close, however, Don Mattrick, President of Interactive Entertainment Business, stepped back on the stage to announce a new trilogy. Naturally, everyone decided to sit back down and watch. Starting slowly, gamers first see balls of light moving in the blackness of space. As the music picks up, however, we quickly realize that we are in the mind of Master Chief awaking from a pod. After breaking out, Chief shares a small moment with Cortana before making his way out of the space craft to witness the destruction around him. Although this entire clip was only a cinematic, a legitimate sequel to the Halo franchise can only be met with eager anticipation. At the same time, this will be the first proper Halo titled that is not being made by Bungie. All eyes are on 343 Industries to not only create the first chapter in this new trilogy, but also to make a game that is better than Halo 3 or Reach. After all, we are expecting at least two more games after Halo 4 is released so 343I needs to present a solid first showing if they want us to keep going back. No pressure. Whether it was games we were expected or ones that we had no idea were coming, Xbox 360’s media briefing really blew me away. Sure there were weaker elements to the show like the awful actors they hired to play the games, the actual content that was shown was creative, innovative, and exactly what I needed at 9 in the morning. I can only hope Nintendo will bring their A-game to give Microsoft a run for their money. You have a typo about Halo Anniversary. It’s only a remake of the first game, but one of the 7 multiplayer maps included for Reach is from Halo 2. Thanks, Bob. The edit has been made.